Choose a link to select a section. Your Use of This Site Is Governed By An Agreement To Arbitrate Disputes. You Agree To Submit All Disputes Concerning This Agreement, Your Use of This Web site, and Any Products or Services You Purchase Through the Web site To Confidential, Binding Individual Arbitration, And You Agree To Give Up Your Right To Represent Other Persons In A Class Action or Similar Proceeding. Select product can be found in our Stores in the United States while supplies last. In some cases, merchandise displayed for sale on the Site may not be available in stores. The particular technical specifications and settings of your computer and its display could affect the accuracy of its display of the colors of products offered on the Site. All content on this Site (including, without limitation, text, design, graphics, logos, icons, images, audio clips, downloads, interfaces, code and software, as well as the selection and arrangement thereof), is the exclusive property of and owned by Haggar Clothing Co., its licensors or its content providers and is protected by copyright, trademark and other applicable laws. You may access, copy, download and print the material contained on the Site for your personal and non-commercial use, provided you do not modify or delete any copyright, trademark or other proprietary notice that appears on the material you access, copy, download or print. Any other use of content on the Site, including but not limited to the modification, distribution, transmission, performance, broadcast, publication, uploading, licensing, reverse engineering, transfer or sale of, or the creation of derivative works from, any material, information, software, products or services obtained from the Site, or use of the Site for purposes competitive to Haggar Clothing Co., is expressly prohibited. Haggar Clothing Co. reserves the right to refuse or cancel any person's registration for this Site, remove any person from this Site or prohibit any person from using this Site for any reason whatsoever. 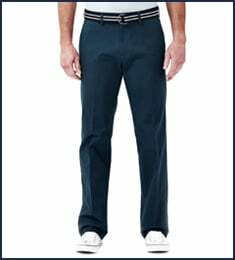 Haggar Clothing Co., or its licensors or content providers, retain full and complete title to the material provided on the Site, including all associated intellectual property rights, and provide this material to you under a license that is revocable at any time in Haggar Clothing Co.'s sole discretion. Haggar Clothing Co. neither warrants nor represents that your use of materials on this Site will not infringe rights of third parties not affiliated with Haggar Clothing Co.
You may not use contact information provided on the Site for unauthorized purposes, including marketing. You may not use any hardware or software intended to damage or interfere with the proper working of the Site or to surreptitiously intercept any system, data or personal information from the Site. You agree not to interrupt or attempt to interrupt the operation of the Site in any way. Haggar Clothing Co. reserves the right, in its sole discretion, to limit or terminate your access to or use of the Site at any time without notice. You are personally liable for any orders that you place or charges or other liabilities that you incur prior to termination. Termination of your access or use will not waive or affect any other right or relief to which Haggar Clothing Co. may be entitled, at law or in equity. If you do submit material, and unless we indicate otherwise, you grant Haggar Clothing Co. and its affiliates a nonexclusive, royalty-free, perpetual, irrevocable and fully sublicensable right to use, reproduce, modify, adapt, publish, translate, create derivative works from, distribute and display such material throughout the world in any media. You grant Haggar Clothing Co. and its affiliates the right to use the name you submit in connection with such material, if they so choose. All personal information provided via this Site will be handled in accordance with the Site's online Privacy Notice. You represent and warrant that you own or otherwise control all the rights to the content you post; that the content is accurate; that use of the content you supply does not violate any provision herein and will not cause injury to any person or entity; and that you will defend and indemnify Haggar Clothing Co. for all claims resulting from content you supply. Some features that may be available on this Site require registration. By registering at, and in consideration of your use of, the Site you agree to provide true, accurate, current and complete information about yourself. Some features on this Site may require use of a password. You are responsible for protecting your password. You agree that you will be responsible for any and all statements made, and acts or omissions that occur, through the use of your password. If you have any reason to believe or become aware of any loss, theft or unauthorized use of your password, notify Haggar Clothing Co. immediately. Haggar Clothing Co. may assume that any communications Haggar Clothing Co. receives under your password have been made by you unless Haggar Clothing Co. receives notice otherwise. You or third parties acting on your behalf are not allowed to frame this Site or use our proprietary marks as meta tags, without our written consent. These marks include, but are not limited to, "Haggar", "Haggar Clothing Co.", "PNIK”, “Cool 18 Pro”, and “Work to Weekend”. 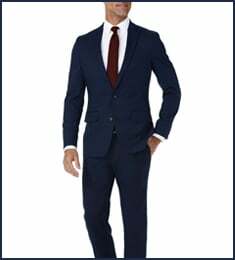 You may not use frames or utilize framing techniques or technology to enclose any content included on the Site without Haggar Clothing Co.'s express written consent. Further, you may not utilize any Site content in any meta tags or any other "hidden text" techniques or technologies without Haggar Clothing Co.'s express written consent. This Site may contain links to other Web sites, some of which are operated by Haggar Clothing Co. or its affiliates and others of which are operated by third parties. These links are provided as a convenience to you and as an additional avenue of access to the information contained therein. We have not necessarily reviewed all the information on those other sites and are not responsible for the content of those or any other sites or any products or services that may be offered through those or any other sites. Inclusion of links to other sites should not be viewed as an endorsement of the content of linked sites. Different terms and conditions may apply to your use of any linked sites. Haggar Clothing Co. is not responsible for any losses, damages or other liabilities incurred as a result of your use of any linked sites. Trademarks, logos and service marks displayed on this Site are registered and unregistered trademarks of Haggar Clothing Co., its licensors or content providers, or other third parties. All of these trademarks, logos and service marks are the property of their respective owners. Nothing on this Site shall be construed as granting, by implication, estoppel, or otherwise, any license or right to use any trademark, logo or service mark displayed on the Site without the owner's prior written permission, except as otherwise described herein. 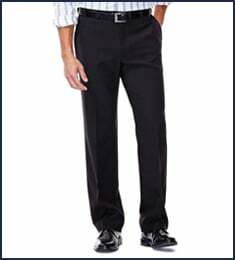 Haggar Clothing Co. reserves all rights not expressly granted in and to the Site and its content. This Site and all of its content, including but not limited to text, design, graphics, interfaces and code, and the selection and arrangement thereof, is protected as a compilation under the copyright laws of the United States and other countries. Haggar Clothing Co. is under no obligation to post, forward, transmit, distribute or otherwise provide any material available on this Site, including material you provide to us, and so we have an absolute right to remove any material from the Site in our sole discretion at any time. YOUR USE OF THIS SITE IS AT YOUR SOLE RISK. THE SITE IS PROVIDED ON AN "AS IS" AND "AS AVAILABLE" BASIS. WE RESERVE THE RIGHT TO RESTRICT OR TERMINATE YOUR ACCESS TO THE SITE OR ANY FEATURE OR PART THEREOF AT ANY TIME. HAGGAR CLOTHING CO. EXPRESSLY DISCLAIMS ALL WARRANTIES OF ANY KIND, WHETHER EXPRESS OR IMPLIED, INCLUDING BUT NOT LIMITED TO THE IMPLIED WARRANTIES OF MERCHANTABILITY AND FITNESS FOR A PARTICULAR PURPOSE AND ANY WARRANTIES THAT MATERIALS ON THE SITE ARE NONINFRINGING, AS WELL AS WARRANTIES IMPLIED FROM A COURSE OF PERFORMANCE OR COURSE OF DEALING; THAT ACCESS TO THE SITE WILL BE UNINTERRUPTED OR ERROR-FREE; THAT THE SITE WILL BE SECURE; THAT THE SITE OR THE SERVER THAT MAKES THE SITE AVAILABLE WILL BE VIRUS-FREE; OR THAT INFORMATION ON THE SITE WILL BE COMPLETE, ACCURATE OR TIMELY. IF YOU DOWNLOAD ANY MATERIALS FROM THIS SITE, YOU DO SO AT YOUR OWN DISCRETION AND RISK. YOU WILL BE SOLELY RESPONSIBLE FOR ANY DAMAGE TO YOUR COMPUTER SYSTEM OR LOSS OF DATA THAT RESULTS FROM THE DOWNLOAD OF ANY SUCH MATERIALS. NO ADVICE OR INFORMATION, WHETHER ORAL OR WRITTEN, OBTAINED BY YOU FROM HAGGAR CLOTHING CO. OR THROUGH OR FROM THE SITE SHALL CREATE ANY WARRANTY OF ANY KIND. HAGGAR CLOTHING CO. DOES NOT MAKE ANY WARRANTIES OR REPRESENTATIONS REGARDING THE USE OF THE MATERIALS ON THIS SITE IN TERMS OF THEIR COMPLETENESS, CORRECTNESS, ACCURACY, ADEQUACY, USEFULNESS, TIMELINESS, RELIABILITY OR OTHERWISE. YOU ACKNOWLEDGE AND AGREE THAT YOU ASSUME FULL RESPONSIBILITY FOR YOUR USE OF THE SITE. YOU ACKNOWLEDGE AND AGREE THAT ANY INFORMATION YOU SEND OR RECEIVE DURING YOUR USE OF THE SITE MAY NOT BE SECURE AND MAY BE INTERCEPTED BY UNAUTHORIZED PARTIES. YOU ACKNOWLEDGE AND AGREE THAT YOUR USE OF THE SITE IS AT YOUR OWN RISK AND THAT THE SITE IS MADE AVAILABLE TO YOU AT NO CHARGE. RECOGNIZING SUCH, YOU ACKNOWLEDGE AND AGREE THAT, TO THE FULLEST EXTENT PERMITTED BY APPLICABLE LAW, NEITHER HAGGAR CLOTHING CO. NOR ITS AFFILIATES, SUPPLIERS OR THIRD PARTY CONTENT PROVIDERS WILL BE LIABLE FOR ANY DIRECT, INDIRECT, PUNITIVE, EXEMPLARY, INCIDENTAL, SPECIAL, CONSEQUENTIAL OR OTHER DAMAGES ARISING OUT OF OR IN ANY WAY RELATED TO THE SITE, OR ANY OTHER SITE YOU ACCESS THROUGH A LINK FROM THIS SITE OR FROM ANY ACTIONS WE TAKE OR FAIL TO TAKE AS A RESULT OF COMMUNICATIONS YOU SEND TO US, OR THE DELAY OR INABILITY TO USE THE SITE, OR FOR ANY INFORMATION, PRODUCTS OR SERVICES ADVERTISED IN OR OBTAINED THROUGH THE SITE, HAGGAR CLOTHING CO.'S REMOVAL OR DELETION OF ANY MATERIALS SUBMITTED OR POSTED ON ITS SITE, OR OTHERWISE ARISING OUT OF THE USE OF THE SITE, WHETHER BASED ON CONTRACT, TORT, STRICT LIABILITY OR OTHERWISE, EVEN IF HAGGAR CLOTHING CO., ITS AFFILIATES OR ANY OF ITS SUPPLIERS OR THIRD PARTY CONTENT PROVIDER HAS BEEN ADVISED OF THE POSSIBILITY OF DAMAGES. THIS DISCLAIMER APPLIES, WITHOUT LIMITATION, TO ANY DAMAGES OR INJURY ARISING FROM ANY FAILURE OF PERFORMANCE, ERROR, OMISSION, INTERRUPTION, DELETION, DEFECTS, DELAY IN OPERATION OR TRANSMISSION, COMPUTER VIRUSES, FILE CORRUPTION, COMMUNICATION-LINE FAILURE, NETWORK OR SYSTEM OUTAGE, YOUR LOSS OF PROFITS, OR THEFT, DESTRUCTION, UNAUTHORIZED ACCESS TO, ALTERATION OF, LOSS OR USE OF ANY RECORD OR DATA, AND ANY OTHER TANGIBLE OR INTANGIBLE LOSS. YOU SPECIFICALLY ACKNOWLEDGE AND AGREE THAT NEITHER HAGGAR CLOTHING CO. NOR ITS AFFILIATES, SUPPLIERS OR THIRD PARTY CONTENT PROVIDER SHALL BE LIABLE FOR ANY DEFAMATORY, OFFENSIVE OR ILLEGAL CONDUCT OF ANY USER OF THE SITE. 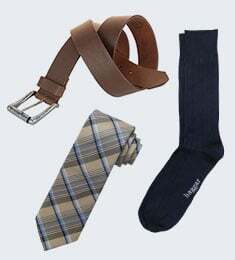 YOUR SOLE AND EXCLUSIVE REMEDY FOR ANY OF THE ABOVE CLAIMS OR ANY DISPUTE WITH HAGGAR CLOTHING CO. IS TO DISCONTINUE YOUR USE OF THE SITE. YOU AND HAGGAR CLOTHING CO. AGREE THAT ANY CAUSE OF ACTION ARISING OUT OF OR RELATED TO THE SITE MUST COMMENCE WITHIN ONE (1) YEAR AFTER THE CAUSE OF ACTION ACCRUES OR THE CAUSE OF ACTION IS PERMANENTLY BARRED. BECAUSE SOME JURISDICTIONS DO NOT ALLOW LIMITATIONS ON HOW LONG AN IMPLIED WARRANTY LASTS, OR THE EXCLUSION OR LIMITATION OF LIABILITY FOR CONSEQUENTIAL OR INCIDENTAL DAMAGES, ALL OR A PORTION OF THE ABOVE LIMITATION MAY NOT APPLY TO YOU. The only exceptions to this arbitration agreement are that (i) each of you and we retain the right to sue in small claims court and (ii) each of you and we may bring suit in court against the other to enjoin infringement or other misuse of intellectual property rights. To begin an arbitration proceeding, you must send a letter requesting arbitration and describing your claim to our registered agent. During the first 45 days after we receive your notice (the "Pre-Arbitration Period"), we may try to reach a settlement of the dispute. If we do not resolve the dispute ourselves within the Pre-Arbitration Period, you may commence arbitration. The arbitration will be conducted by Judicial Arbitration and Mediation Services, Inc. ("JAMS"), pursuant to the JAMS Streamlined Arbitration Rules & Procedures effective July 1, 2014 (the "JAMS Rules"), as modified by this Agreement. The JAMS Rules are available at at http://www.jamsadr.com/rules-streamlined-arbitration/ www.adr.org or by calling 1-800-352-5267. Arbitration firms ordinarily charge fees to both sides to conduct arbitrations. The claimant in arbitration heard by JAMS has to pay $250 or the then current fee to start a case, whether the claimant wins or loses. In the event you commence arbitration for an amount less than $10,000, after we receive notice that you have done so, we will reimburse you for your payment of this filing fee and we will pay JAMS any case management fees associated with the arbitration and the professional fees for the arbitrator's services, pursuant to the JAMS Rules. We will not seek to recover the filing fee we reimbursed to you unless the arbitrator determines that you brought your claim frivolously or for an improper purpose. Each of us may incur attorneys' fees during the arbitration. Each of us will bear our own attorneys' fees, except in the following circumstances. If applicable law permits a prevailing party to recover attorneys' fees, the prevailing party may seek fees as applicable law permits. If applicable law does not permit a prevailing party to recover its attorneys' fees, but you prevail in the arbitration and win an award at least 25% greater than our highest pre-arbitration settlement offer, then we will pay your reasonable attorneys' fees for time reasonably expended at rates that prevail for attorneys in your home county, in an amount not to exceed the greater of $10,000 or 20% of the arbitrator's damages award to you. If we prevail in the arbitration, we will seek to recover our reasonable attorneys' fees and reimbursement of arbitration costs only if applicable law permits a prevailing party to seek fees or if the arbitrator finds that you brought a claim frivolously or for an improper purpose and applicable law does not preclude us from seeking our fees and costs. The arbitration will be conducted by one neutral arbitrator selected with the participation and involvement of both parties pursuant to the JAMS Rules. If your claim is for $10,000 or less, we agree, pursuant to the JAMS Rules, that the dispute should be resolved without an oral hearing, unless the arbitrator requests otherwise. Any in-person hearing for a claim of less than $10,000 must be conducted in Dallas, Texas. If your claim is for more than $10,000, the manner and place of the hearing will be determined in accordance with the JAMS Rules. Regardless of how the arbitration proceeds, the arbitrator shall issue a reasoned written decision sufficient to explain his or her findings and conclusions. The arbitrator's decision and award are final and binding, subject only to the limited court review permitted under the FAA, and judgment on the award may be entered in any court of competent jurisdiction. We agree that the arbitrator may award declaratory or injunctive relief only in favor of the individual party seeking relief and only to the extent necessary to provide relief warranted by that party's individual claim. The arbitrator may not order us to pay any monies to or take any actions with respect to persons other than you, unless we explicitly consent in advance, after an arbitrator is selected, to permit the arbitrator to enter such an order. YOU AND WE AGREE THAT EACH MAY BRING CLAIMS AGAINST THE OTHER ONLY IN YOUR OR OUR INDIVIDUAL CAPACITY, AND NOT AS A PLAINTIFF OR CLASS MEMBER IN ANY CLASS ACTION, REPRESENTATIVE OR MULTI-CLAIMANT PROCEEDING. Further, unless we both agree in writing, the arbitrator may not consolidate other persons' claims with yours or ours, and may not otherwise preside over any form of a representative, multi-claimant or class arbitration proceeding. If this specific provision is found to be unenforceable, then the entirety of this arbitration provision shall be null and void. If for any reason a claim proceeds in court rather than in arbitration, we each waive any right to a jury trial and we each irrevocably consent to the exclusive jurisdiction of the courts located in Dallas County, Texas.